This is an outstanding example of the Art Deco style, featuring the characteristic hallmarks of the movement. A small smokers’ table manufactured of dark brown phenol-formaldehyde (Bakelite) and cream colored urea-formaldehyde resin. The object displays the graceful, elegant lines and curves for which Deco is prized. 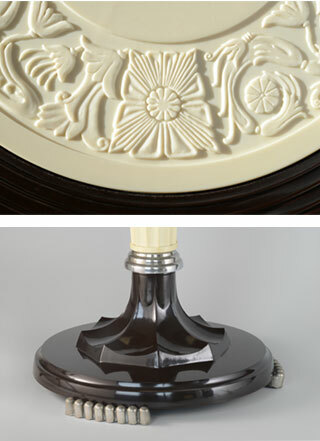 The remarkable floral motif of the table top demonstrates the highly skilled precision and craftsmanship of the mold makers. All plastic parts are compression molded. 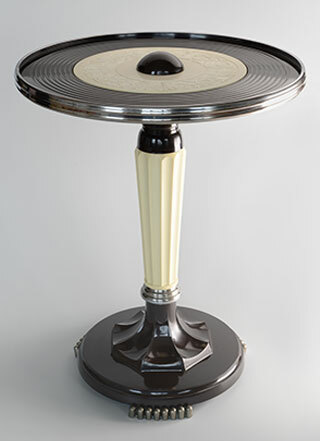 The rim around the table top, the connection between the foot and the center column and the cast metal base, are all chrome plated. The table was manufactured in the thirties/fourties by the Australian company, Tilley Plastics Ltd. in Melbourne. A SHINING OBJECT IN OUR COLLECTION! Provenance: Acquired from the collection of the late Mr. Hennie Hooghuis.